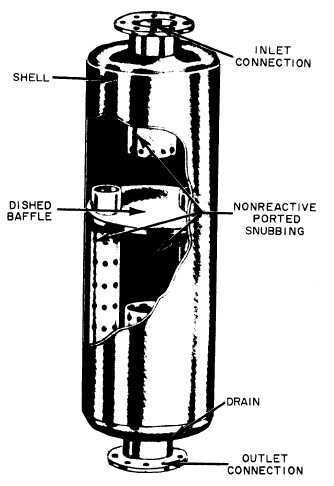 should be used whenever potential noise level difficulties are anticipated. Intake resistance to airflow should be no more than necessary to maintain air quality. The resistance created by the air intake system will reduce compressor performance and efficiency. Refer to the compressor manufacturer's manual for maximum resistance requirements. Air filters are provided on compressor intakes to prevent atmospheric dust from entering the cylinders and causing scoring and excessive wear. The two most common types of elements in use are the VISCOUS IMPINGEMENT and the OIL BATH. Both types are illustrated in figure 11-10. Figure 11-10. - Compressor intake filters. In the oil bath type, air must pass through an oil seal that removes dirt particles, and then pass on through a wire mesh element, which is saturated by oil carry-over. Any remaining particles of dirt are removed by the wire mesh element. Captured dust particles settle to a sump at the bottom of the filter housing. Oil bath filters are recommended where dust concentrations are present in the atmosphere. 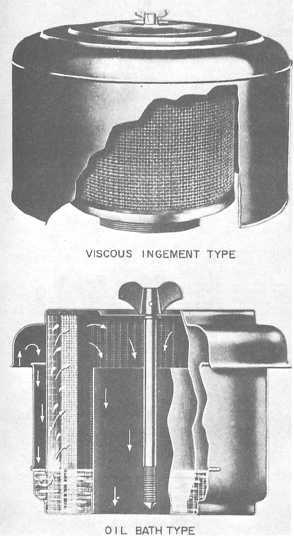 The viscous impingement filter consists of a wire mesh filter element, which is coated with oil. Air passing through the filter element must change directions many times, causing any dust to adhere to the oil film. Figure 11-11. - Intake silencer.